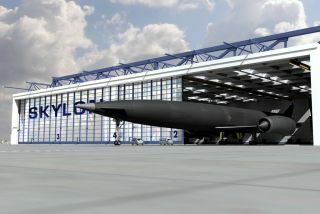 Skylon, a concept space plane from Reaction Engines Ltd., is an entirely reusable single stage-to-orbit launch vehicle, based on revolutionary engine technology. FARNBOROUGH, England — Astrium Space Transportation and OHB AG will lead two consortia to perform a design of a new heavy-lift launch vehicle for the European Space Agency (ESA) following a bidding competition that included a surprise third bidder in Reaction Engines Ltd. of Britain, ESA Director-General Jean-Jacques Dordain said here July 10. The British bidder, a company that for more than a decade has been designing a space plane called Skylon using a radical new engine design for atmospheric and orbital flight, was not selected for what ESA calls its New European Launch Service. But ESA, whose Estec technology directorate in Noordwijk, Netherlands, has been monitoring Reaction Engines’ work for the past couple of years, was sufficiently impressed with the proposal to ask its launcher directorate to engage with the company starting this month. Astrium Space Transportation is prime contractor for Europe’s Ariane 5 heavy-lift rocket. Its consortium includes ELV of Italy, which is prime contractor for Europe’s new Vega small-satellite launcher. OHB of Germany is a major Ariane 5 supplier through its MT Aerospace division. The two teams have begun work under one-year contracts valued at about 2 million euros ($2.5 million) each. Both will provide a near-term report to ESA in September for the agency to use in preparation for a late-November meeting of ESA governments to set multiyear budget and program priorities. The New European Launch Service is a reversal of ESA’s past practice with respect to major developments. In the past, the agency would work with its governments to determine each nation’s level of enthusiasm for a given project. A budget would be set after the national contributions were added together, and only then would an industrial team be assembled. This procedure has had the disadvantage of forcing ESA to build launchers with industrial contracting teams spread throughout Europe, with the size of each company’s role determined in advance by the level of its government’s commitment. The resulting Ariane 5 rocket has been more expensive to build and maintain — so much so that the successful, mature vehicle requires some 120 million euros a year in ESA government support payments. The new bid requests permit the industrial teams to design their own rockets without worrying about which government will contribute to it. Dordain has said the primary goal is a vehicle that will not need support payments under normal operations once it has proved its design. ESA officials have been spooked by Space Exploration Technologies Corp. (SpaceX) of Hawthorne, Calif., which has demonstrated its technical prowess with the launch of its Falcon 9 rocket and Dragon space capsule to the International Space Station in May. SpaceX officials say one of the keys to its success is that Falcon 9 is built in one factory owned by SpaceX. “That’s not building an industry, it’s just building a company,” scoffed one official with a commercial rocket supplier competing with SpaceX. But for European government officials concerned about the long-term viability of their Ariane rocket line, SpaceX has become a useful case study of one way to cut costs. The rocket design sought by ESA would be capable of placing satellites weighing between 6,600 and 14,300 pounds (3,000 and 6,500 kilograms) into geostationary transfer orbit, the destination of most telecommunications satellites. Estimates of how much it would cost to develop such a vehicle vary between 3 billion euros to 6 billion euros over 10 years or more. That alone may turn off European governments when they meet in November and decide whether to upgrade the current Ariane 5 or start development of a new rocket. Using a recoverable upper stage, the concept starship Skylon space plane could deliver communications satellites to geosynchronous orbit, and then retrieve the upper stage and return it to Earth to be reused for further missions. Abingdon, England-based Reaction Engines’ Skylon rocket would cost even more — some 10 billion euros over 10-12 years, according to Mark Hempsell, the company’s director of future programs. The key component, which has been a focus of the company’s work for years, is SABRE, the Synthetic Air-Breathing Rocket Engine. SABRE doubles as both a jet engine for suborbital flights and as a rocket engine to place satellites into orbit. The heart of the testing now underway is on the engine’s precooler, which must transform air entering the engine at more than 1,830 degrees Fahrenheit (1,000 degrees Celsius) to minus 238 degrees Fahrenheit (minus 150 degrees Celsius) in one one-hundredth of a second. ESA has sent teams to monitor the precooler’s development, in part with funding provided by the U.K. Space Agency. A third series of demonstrations of the precooler are scheduled for August. Willetts said that he would work with the British Department for Transport to modify national regulations to permit space planes to operate in British airspace. He said the European Commission has agreed to pursue similar modifications with the European Air Safety Agency.